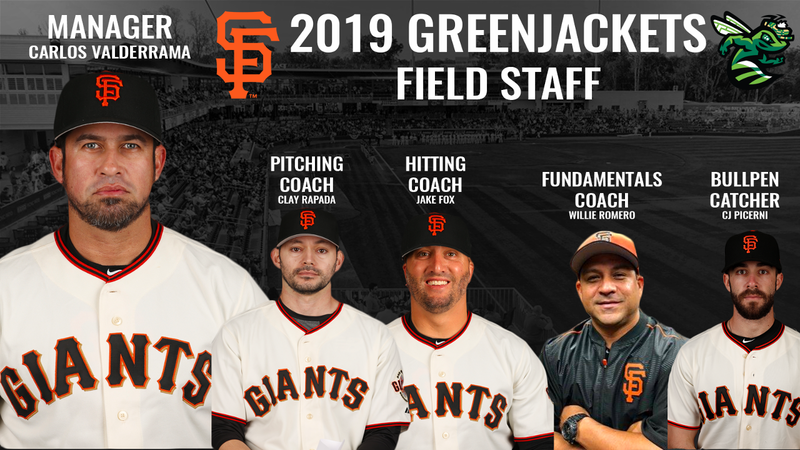 NORTH AUGUSTA, SC - The Augusta GreenJackets, Single 'A' Affiliate of the San Francisco Giants, in conjunction with their parent club, the San Francisco Giants, have announced the 2019 Field Staff for SRP Park. Carlos Valderrama will take over the reigns of the managerial post as we welcome him back for his second season in the CSRA. Returning to the staff to join Valderrama is Clay Rapada , Pitching Coach, and Jesse White, Strength Coach. New to the staff in 2019 will be Jake Fox, Hitting Coach, Willie Romero, Fundamentals Coach, Chad Lewis, Trainer, and C.J. Picerni, Bullpen Catcher. Valderrama, 41, managed the GreenJackets in the last season at Lake Olmstead Stadium (2017). Before the 2017 season, Valderrama lead the 2016 Dominican Summer League Giants to a 40-30 record and finished third in the Dominican Summer League South Division. He has been a hitting coach with the Giants for 7 years and as a manager for 3 years. He helped lead the DSL team to a championship in 2015. He has 12 years of playing experience and saw playing time in 7 games in 2003 with the San Francisco Giants. Overall, Valderrama has 23 years of experience in pro ball and 22 of those years with the San Francisco Giants. "I look forward to our second year at SRP Park in North Augusta. The community support we receive is integral in the development of our players and I know Valdy and his staff are looking forward to a successful 2019 season. "-Kyle Haines, San Francisco Giants Director of Player Development. Rapada returns as Pitching Coach for his fourth season for the GreenJackets. Rapada spent parts of seven seasons in the Major Leagues with the Chicago White Sox, Detroit Tigers, Texas Rangers, Baltimore Orioles, New York Yankees and the Cleveland Indians. 2019 will be his 4th season in the Giants organization. Under Rapada's tutelage in 2018, two pitchers, John Gavin and Joey Marciano, were chosen for the 2018 All-Star Game. Fox joins the GreenJackets as the Hitting coach for the 2019 season. Fox was a third-round draft pick for the Chicago Cubs in the 2003 MLB draft. Fox made his MLB debut with the Chicago Cubs in 2007. Fox spent time with the Oakland Athletics, Baltimore Orioles and in the KBO League for the Hanwha Eagles. Romero joins the GreenJackets as the Fundamentals Coach for the 2019 season. Romero spent 19 seasons as a player from 1993-2012 with stints in the Dodgers (1993-98), Diamondbacks (2001) and Orioles (2003) systems, in addition to 13 years in the Mexican League. Romero, who reached the Triple-A level, hit 172 home runs over the course of his minor league career. Prior to joining the Giants organization this year, Romero served as a manager and coach in the Mexican League. "We look forward to welcoming Valdy, Clay and the staff back to North Augusta in 2019," said Augusta GreenJackets Vice President, Tom Denlinger. "We are eager to build upon the success of last season and look forward to playing Valdy ball at SRP Park. We thank the Giants not only for their commitment to the CSRA, but for providing us with a first-class staff to lead the GreenJackets in our second season at SRP Park." SRP Park is the anchor piece of Riverside Village, a live, work, "playball" development which includes apartment living, senior living, retail, restaurants, class "A" office space, and a Crowne Plaza Hotel and Conference Center. To learn more about SRP Park and hosting events and availability, visit www.thesrppark.com. 2019 Augusta GreenJackets season tickets are on sale now. To learn more about the benefits and to get in on the 2019 action, visit www.greenjacketsbaseball.com or call (803) 349-WINS (9467).